(1). Weekly cleaning for stays equal or superior to 8 nights. The Residhome Nice Promenade aparthotel, located near the famous Promenade des Anglais, offers ready-to-live-in apartments and personalized service. 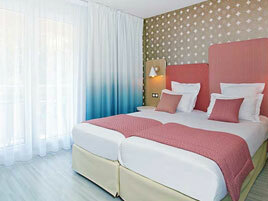 The residential hotel is located just a 3-minute walk from the Promenade des Anglais and its beaches. The bustling neighborhood boasts shops, supermarkets, restaurants, and the town center (Place Masséna) is a 15-20 minute walk. There is no shortage of local attractions: you can visit Nice's Fine Arts Museum, just near the residence, the Massena Museum, the Roman amphitheater, Cours Saleya, the Castle Hill, or take a stroll through the quintessential narrow streets of the old town. Open 24 hours a day, the residence is made up of 61 air-conditioned apartments (studios, large studios, and one-bedroom units), each with a private balcony, in a quiet, pleasant setting. They each have a living room, office area, a fully-equipped kitchen (cooktop, refrigerator, microwave oven, dishwasher, dishes, etc. ), a bathroom and a flat screen television. You will appreciate the complimentary amenities and services available to you, such asinternet access (WiFi connection), weekly housekeeping, a safe, etc. You can also take advantage of a panoramic sun deck and catch a glimpse of the sea from your deckchair! Many services and amenities that are available for an additional fee will make your stay a smooth one: buffet breakfast, laundry room, underground parking, beach towel rental, etc.